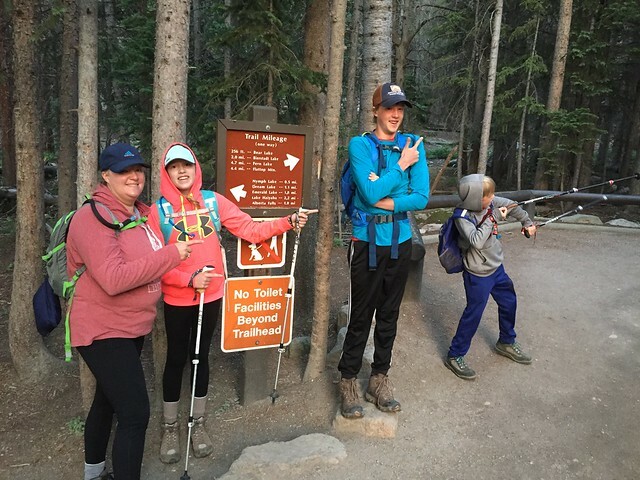 We often have an “Adjustment Period” when we hike as a family. This usually happens in the early part of a hike, where aggravations mount, tempers flare, and despair can feel overpowering. 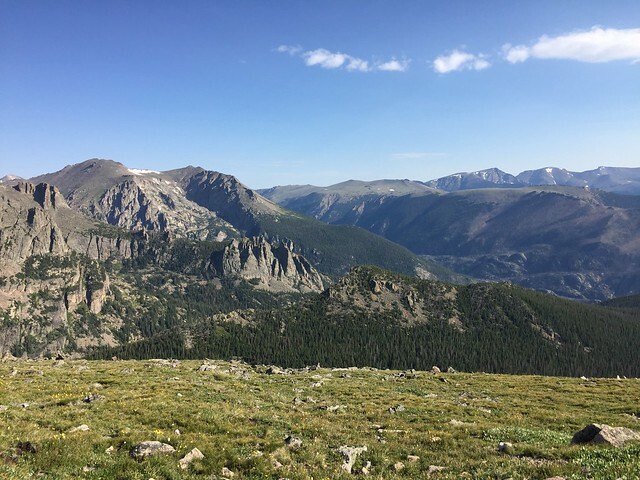 We’ve observed this on all different sorts of hikes in all different settings, so we really weren’t sure what to expect with a 3-peak, 13.5-mile belly-whopper in the Rocky Mountain National Park. All things considered, though, we handled the early challenges of our hike pretty well. 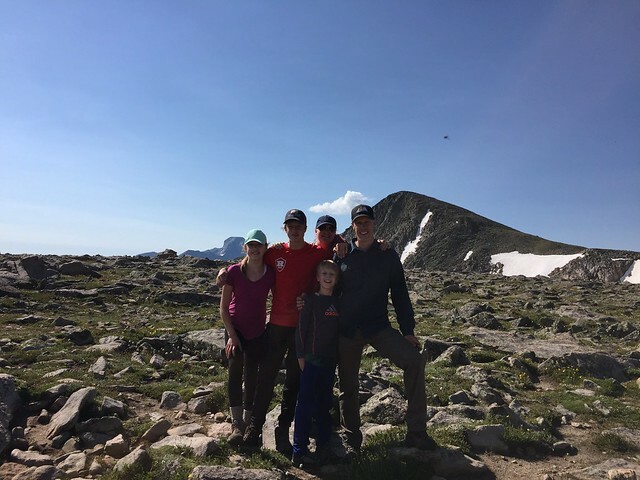 It might have even been our shortest and easiest Adjustment Period ever, in fact, if it weren’t for the mosquitoes on the way up Flattop Mountain. The insects were unusually intense. Still, we managed all right. We took plenty of rests to enjoy the scenery along the way, and after awhile we settled into a rhythm. When we made it up above tree line, spirits brightened considerably. 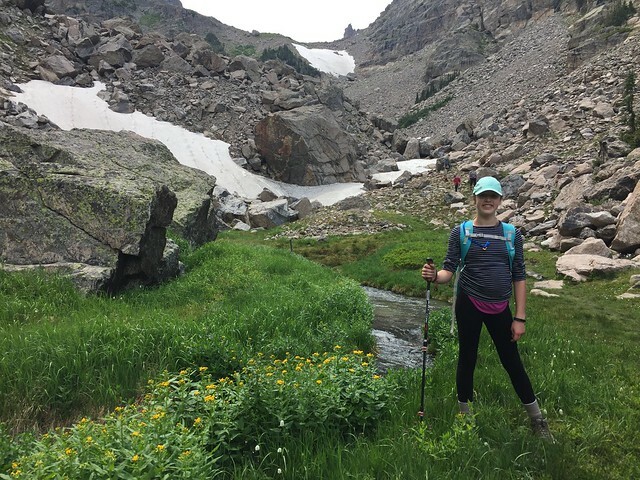 We delighted to hear the sound of furry pikas calling to one another across the tundra, and we cringed to hear Elliot singing to the marmots along the trail — but it was all in good fun. 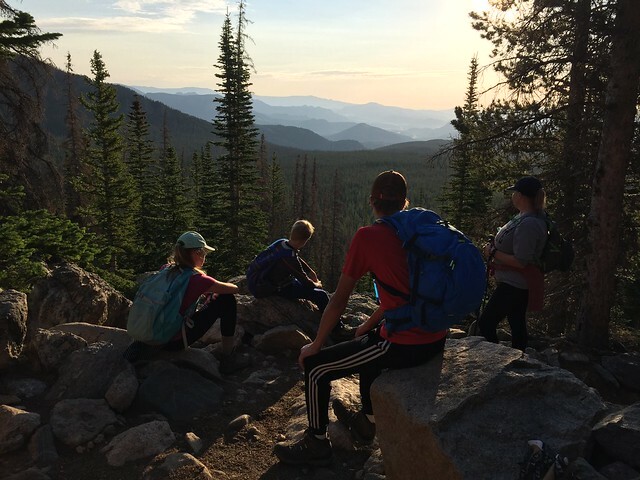 The awe-inspiring views also helped to take our minds off the physical exertion involved. 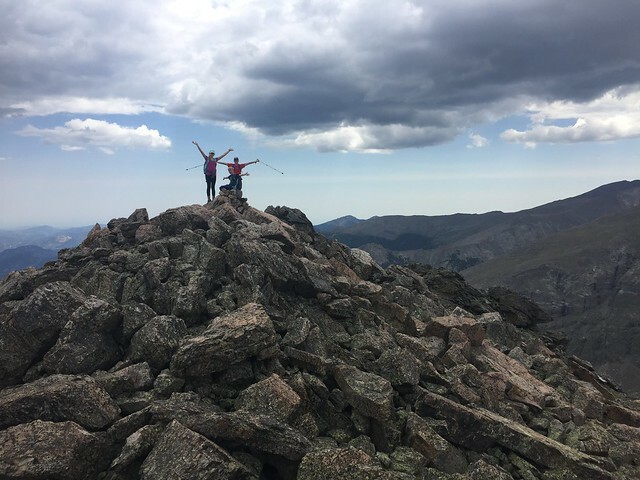 When we finally summitted Flattop Mountain, we were astonished by the stillness at the top. We brought all kinds of winter-wear and windbreakers along with us in our packs. When we sat to eat a snack, though, it was warm and windless enough that we would have been comfortable in short sleeves. Most of the elevation gain was out of the way by the time we got up Flattop Mountain. Still, Hallett Peak felt like a real accomplishment, as it was the tallest and steepest of the three peaks. When we made it to the top, we took a bunch of pictures (though none of them were particularly good at conveying the experience) and helped make friends by taking other people’s pictures for them as well. Some clouds started rolling in on our way up to Otis Peak. The winds picked up slightly. 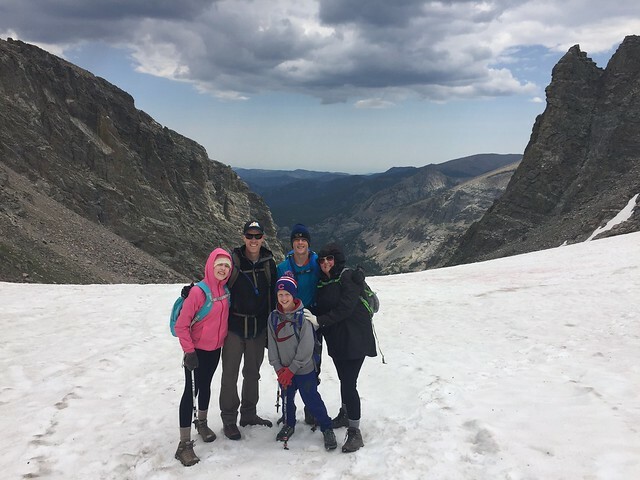 Some of our new mountaintop friends told us that there may be some challenges to our exit strategy — down Andrew’s Glacier toward the Loch — so there was a level of anxiety and uncertainty that came to be associated with this part of the hike. Still, we were able to complete our final summit without incident. 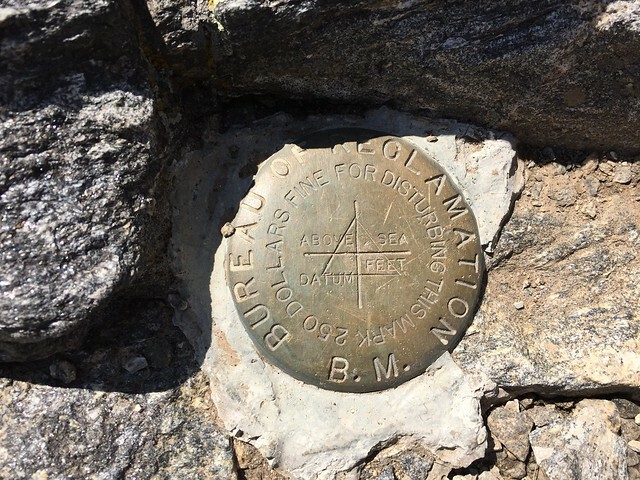 It’s a pretty amazing feeling to make one’s third mountain summit before noon! 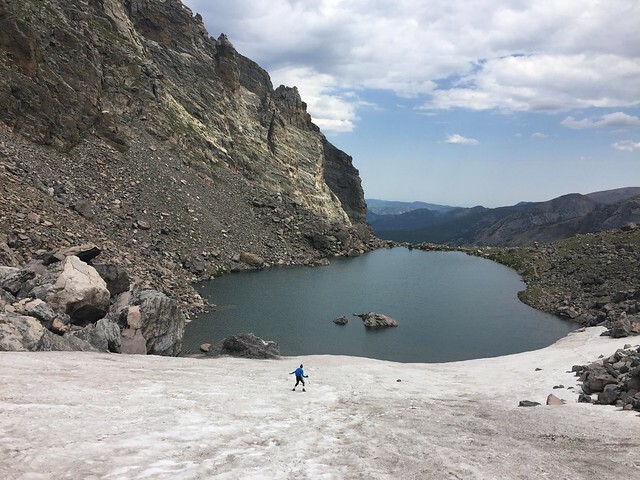 Still with the weather and the uncertainty about conditions on Andrew’s Glacier, we decided we might be wise to figure out our way off the mountaintops before enjoying our lunch. Some reports had apparently been circulating about Andrew’s Glacier: that it was too icy… or that the size of the glacier was diminished by weather conditions… that official hiking guides had been advising people to steer clear of the area… But we knew of some people that had come down that way just a week and a half earlier, and our experiences from two years ago made us feel sufficiently safe that we decided to come down via the glacier after all. The only real “danger” ended up being that our backsides got pretty cold and numb after sliding down the snow for awhile! We made it safely to Andrew’s Tarn in time for lunch, and then we started picking our way down through the valley to Glacier Gorge. The section of trail between Andrew’s Tarn and the Loch was actually the most complicated part of the hike, and we were further challenged by a herd of elk that were feeding right along the trail (completely blocking the trail in some sections). 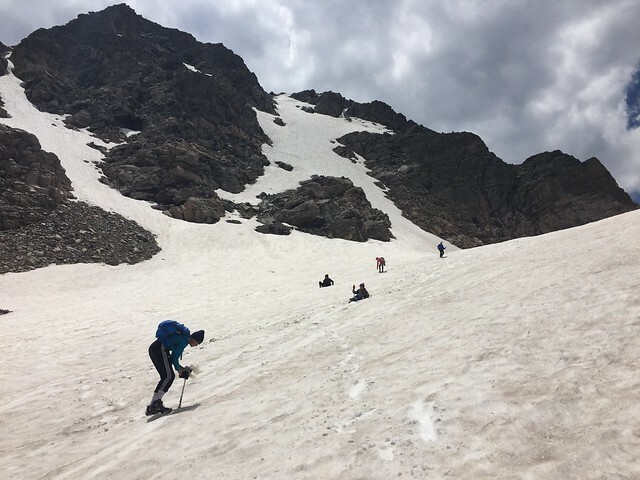 Just after lunch, Elliot tried to lead us across another section of snow and ice (like the ones pictured below). To our horror, we watched as he lost his footing and started sliding down the glacier. He skidded perhaps 25 meters before crashing into the rocks at the bottom of the ice flow and coming to rest on a precarious ice shelf over cascading water. Fortunately, though, he managed to get one foot out in front of him, to lessen the impact at the end, and his wounds were ultimately pretty superficial: some cuts and bruises on one knee. 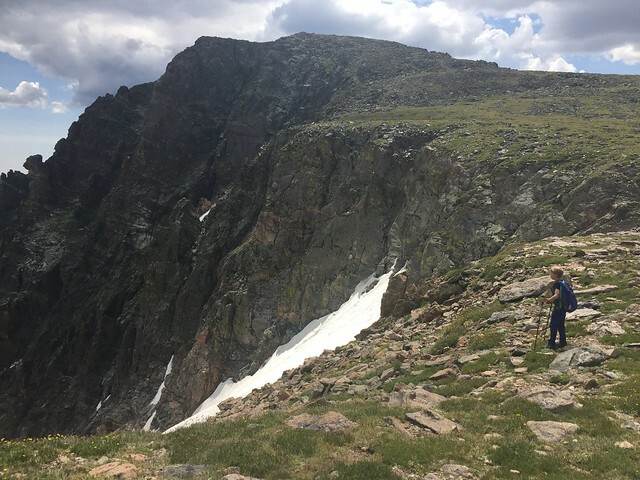 He was able to hike out on his own power, and we all gained a healthy sense of respect for the mountains in the process. We were definitely tired by the time we got back to the trail head. A few tears were shed over the last mile, when we had to do another slight incline to reach our car. Overall, though, I’m really proud of the way we worked together to complete this hike. It’s not the longest or steepest or scariest hike I’ve ever been on — but it may well be the one of which I’m most proud. This entry was posted in Children, Family, Photography, Recreation. Bookmark the permalink.